2. Israel is given/sold into the hands of oppressors. It is important to understand this cycle in light of our story. Judges Chapter 4 is a story which women take the lead in Israel’s defeat of God’s Enemies. It begins with a man named Jabin, the King of Canaan in power and ends with his extinction. Chapter 5- Celebration of Rest for 40 years. It is important to see where we fall in the cycle in our story. We are going to focus on Chapter 4:5 – Chapter 5. Israel is under the reign of Jabin King of Canaan. Sisera is his commander. God raises up Deborah as the Judge. She is called a prophetess and a judge. Deborah commands a man, Barak, who is the general for Israel’s army. Barak acts like a coward even though he is a military leader. Barak received a command by God, but was scared to obey. Barak asks Deborah to go with him. Then in vs. 9 Deborah makes a prophecy: “I will surely go with you. Nevertheless, the road on which you are going will not lead to your glory, for the Lord will sell Sisera into the hand of a woman.” This is the first taste of Jael. Although she is not mentioned by name she is going to be the fulfillment of Deborah’s prophecy. Now the story gets good! Jael comes out and greets Sisera and invites him in. (vs. 18) Jael treats him like a mother. She covers him with a rug- probably some sort of skin. Sisera asks for water, but Jael gives him milk in a very expensive cup. (Chapter 5 shows that) Sisera tries to gain control by giving her a command to stay at the enterance of the tent and tell anyone who asks that no one is here. How ironic that he says No one because he turns out to be a nobody. 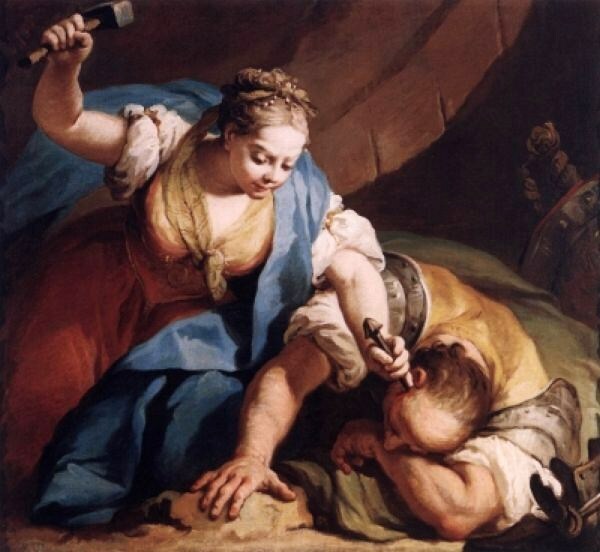 (vs. 20) While Sisera sleeps in her tent, Jael takes a tent peg and hammer and pounds it into his temple. She must have been super strong! This action took resourcefulness (tent peg and hammer) and courage (a powerful General) to slay Sisera. Sisera Dies. Barak comes chasing after Sisera. Once again Jael goes out and greets a man. She takes him in to see Sisera. Barak probably thinks that she has tied him up, but no, he is dead by the hand of a women. Vs. 23 &24 “So on that day God subdued Jabin the King of Canaan before the people of Israel.” This act of killing Sisera was the big defeat. Judges 5: 23-27 also speaks of this event. I absolutely love this poetry. In Hebrew poetry we have contrasts. This is what we see set up in vs.. 23 and 24-28. Deborah contrats Meroz with Jael. Meroz represents those Israelites who have taken their stand on the side of the Canaanites; Jael represents those non-Israelites who have taken their stand on the side of Israel. Meroz is cursed because they did not fight for God and Jael is blessed for her courageous act to bring down mighty Sisera. What a great picture of the Gospel. We would think that Israel would get the blessing, but instead we see Jael, a non-Israelite, receiving the blessing. Just as it is in our lives. Blessing should have been given to Christ and we should have been cursed, but instead Christ became cursed for us and we get the blessing of Christ’s righteousness! This point challenged my heart so much. Jael Had many reasons not to get involved. She was unrelated related to the warring parties, she had her tent-dwelling duties, and acts of war were considered a man’s job. Despite these facts, Jael fought on the side of the Lord! She risked everything to execute the enemy of God and to aid God’s people. She is similar to Ehud (Judges 3:12-30) (FYI: Lack of plot complication in the Ehud story & Jael’s indicate that God is in control over events in the story.) She is similar to Rahab (Joshua 2). Jael risked her life contrasted to the Israelite tribes who stayed at home to play safe. Sisera was an evil man. Judges 5:28-31 give the picture of Sisera’s Mother. He was an evil man who treated women crudely, but was killed by a woman. Jael did not stay uncommitted & simply a good hostess. She could have. Instead she chose to fight for the Lord against the mighty. The Lord expects his people to participate in the advancement of his kingdom. Am I step out of my comfortable service and further God’s Kingdom? What are some areas we can help advance the kingdom of God? Will we be like Jael and fight for God? Jael was used by God to accomplish His WILL. Christianity is not a spectator sport; it requires involvement. Praise the Lord he has given us the blessing of Christ Jesus when we deserve curses. That kind of love should drive us to involvement in what He has called us to do. Thanks for this Angie! I really loved what you brought out in this! Jael is my new favorite ‘bad girl of the Bible’, and your commentary is terrific. Thanks for posting.